Why Choose MOONS' integrated motors? Fusing a motor with its controlling electronics in one single device does more than just eliminate the cost and bulk of the extra wiring. 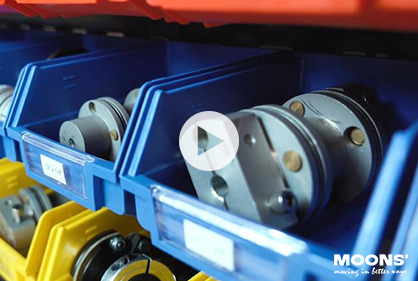 MOONS' integrated motors improve efficiency, reliability, and electromagnetic compatibility. Also, the torque curves for the integrated motors eliminate guesswork. With the indexer/controller, driver, motor, and feedback already combined, the rest of the system integration is simplified. As the Next Evolution in Step Motor Technology, TSM series integrated motors offer the same high-torque-at-low-speed and excellent holding torque characteristics, with the advantages of true closed-loop control. These advantages include the ability to create peak torques up to 50% higher than open loop motors, as well as cooler and quieter operation. For more details, see the Product Details section on individual product pages. The space-saving design of STM series eliminates wiring and help you realized a better cost saving over the conventional motor and drive solutions. With the built-in encoder option, STM integrated motor can be used for Stall Detection or Stall Prevention. Be different with STM-R series, STM series support multiple control options. The STM-R integrated steppers are designed for step & direction (or pulse & direction) control. They are the economical version of STM series. 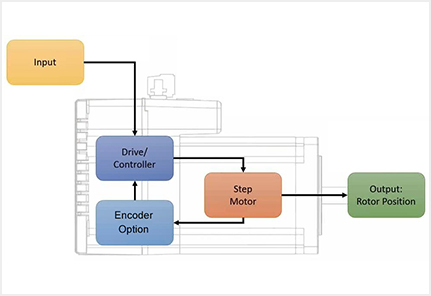 The built-in encoder option that is available on our integrated stepper motors can be used for Stall Detection or Stall Prevention. These encoder functions allow for the integrated drive to either fault (in the case of Stall Detection mode) or to slow down the step motor in order to increase the torque output (in the case of Stall Prevention mode) when the encoder feedback indicates that the motor is stalling or near stalling. Stall Detection in combination with Q programming allows for the integrated stepper to perform a hard-stop homing routine, thereby eliminating the need for an external home sensor. The encoder counts may also be used within Q programs or by a 3rd party host controller/HMI over a network connection. SR3-Mini is one kind of MOONS’ new designed stepper motor drivers. Its special ultra-compact design would allow user to mount anywhere. You could find the encoder made by CUI in our website. This encoder has selectable resolutions up to 2048 PPR. MOONS' Dual shaft stepper motor would be your great choice. Be sure to use an IP65 rated integrated motor such as SWM24 or TXM24/34 series. These motors are sealed so that water and dust cannot get inside and damage the motor or electronics. They use M12 style cables which are also water tight. Based on the rich experience of TSM integrated step-servo, MOONS' once again successfully melt servo control technology into a stepper motor, revolutionary create a separate motor & driver package solution – SS with ultimate performance. Motor frame sizes available is Nema23. SS provides more intelligent combination of flexible, contribute to a more wider range of applications. Based on the rich experience of TXM integrated step-servo, MOONS' once again successfully melt servo control technology into a stepper motor, revolutionary create a separate motor & driver package solution – SS with ultimate performance. Motor frame sizes available is Nema24. SS provides more intelligent combination of flexible, contribute to a more wider range of applications. Based on the rich experience of TXM integrated step-servo, MOONS' once again successfully melt servo control technology into a stepper motor, revolutionary create a separate motor & driver package solution – SS with ultimate performance. Motor frame sizes available is Nema34. SS provides more intelligent combination of flexible, contribute to a more wider range of applications. The STM23 is a integrated motors combines motor+drive+encoder into one device. It supports RS232, RS485 and CANopen, and MOONS’ Q programmer control mode. External switch such as position limit, joystick are also supported. The STM17R Integrated Motor is a cost effective, high performance, motor with the drive built in. It is based on advanced digital current control technology, and features high torque, low noise, and low vibration. Operational parameters are switch selectable. The STM11 is a integrated motors combines motor+drive+encoder into one device. It supports RS232, RS485 and CANopen, and MOONS’ Q programmer control mode. External switch such as position limit, joystick are also supported. The STM24 is a integrated motors combines motor+drive+encoder into one device. It supports RS232, RS485 and CANopen, and MOONS’ Q programmer control mode. External switch such as position limit, joystick are also supported. The STM17 is a integrated motors combines motor+drive+encoder into one device. It supports RS232, RS485 and CANopen, and MOONS’ Q programmer control mode. External switch such as position limit, joystick are also supported.